I've been thinking about what door you use to find a story. I've heard writers say they start with character or with a science idea. Both are great jumping off points. But I start with the world. Where will I take the reader? What milieu, what setting, what geography? In science fiction this question has obvious utility, but it's also a good question for mainstream stories, whether set in a circus, a law firm, or the arctic. Beginning your story search with milieu can kick-start the whole novel, opening a door onto character, society, theme and science. I began with world building for Bright of the Sky. I asked where a galactic-scale story could happen if I didn't want to use space travel. The answer came, a parallel universe. Fine. And then the triggering idea: what if the universe had a shape? Thus began my discovery of the Entire, a tunnel universe with walls and a lid of fire for a sky. After this, the other story pieces cascaded into place. It seemed as though there was an Entire, and I was uncovering its history. Who enters this universe as a stranger? Who built the place? Why? If it is infinitely large, how do the inhabitants travel? What culture would have evolved? Some characters will be especially challenged by being strangers in a specific place. These folks make excellent additions to your cast. Also, certain characters must exist in your milieu. If the world is as big as a galaxy, and if the mode of travel is upon a never-ending river, wouldn't there be a special role for river pilots? If you want to get analytical (let's)-- it makes sense that character is shaped by place. Desert, mountain, sea, the American deep South--these places spawn life-views, attitudes and cultural imperatives. Therefore, culture, too, may flow from place, from the very geography. In Dune, the culture arose from the desert, as surely as the prickly pear cactus from our own Southwest. And so on, down the basic components of story, all springing from the soil, the unique physicality of place. And it makes a lovely answer when people ask you where you get your weird story ideas: From the land. Then smile enigmatically. 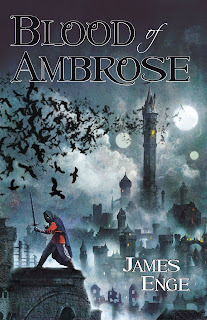 James Enge's Blood of Ambrose is now in stock at Amazon, and at B&N.com. Brick and mortar stores will soon follow! Free Online Reading: James Enge's "A Book of Silences"
April will see the release of James Enge's swords & sorcery novel, Blood of Ambrose, an epic work featuring Morlock Ambrosius, wandering swordsman and master of all magical makers. The book is a stand-alone adventure, but Morlock returns in the (already-delivered) follow-up, This Crooked Way, and we've just signed for a third Morlock novel, the wonderfully-titled The Wolf Age. But Morlock Ambrosius already has a significant following, as Enge has been chronicling his adventures in short fiction for some time prior to his novel debut. One such tale,"A Book of Silences," first appeared in the pages of Black Gate magazine. We are pleased to reprint it in its entirety at the Pyr Sample Chapters page. What's more, we will shortly be presenting "Fire and Sleet," which follows directly on the events of "A Book of Silences" and is an original novelette that will debut at the Pyr website for the first time anywhere. So, read and enjoy! Readers of this blog who live near, or will be travelling to, London next Wednesday (25 March) might be interested in that evening's discussion of the four BSFA Award shortlisted titles featuring Jon Courtenay Grimwood, Alastair Reynolds and myself hosted by the BSFA themselves. The three of us have been asked to consider the great question “What do the BSFA Awards mean to you?” in The Antelope (22 Eaton Terrace, London, SW1W 8EZ) from 6pm onward. All welcome: there's no entry fee or tickets and BSFA non-members are just as welcome as members. Regarding the titles on the BSFA shortlist, I have previously expatiated online, here, here, here and here. Those of you on the west coast who want to catch Ian McDonald, he'll be signing at the Mysterious Galaxy Booth #614 at the Los Angeles Times Festival of Books, held at the UCLA campus on Sunday, April 26, at noon. As SFScope, agent Michael Kabongo, and the author himself have already reported, we've just completed an agreement with James Enge (via the OnyxHawke agency), to publish a third Morlock Ambrosius novel, this one titled The Wolf Age. The Wolf Age is a third stand-alone adventure featuring his wandering swordsman/master maker Morlock, after the forthcoming This Crooked Way, and the coming-really-soon Blood of Ambrose. These novels are swords & sorcery at its best, and I'm eager to unleash Morlock on the wider world. Meanwhile, there are a host of Morlock Ambrosius shorts and previews online and aggregated here. The latest TEDtalks reminds me of nothing so much as the future-world portrayed in Warren Ellis' Transmetropolitan and David Louis Edelman's Infoquake and MultiReal novels. This is Pattie Maes of MIT Media Lab's new Fluid Interfaces Group. Wow! Genreville's Rose Fox posts Nuts & Bolts: Tom Lloyd today. This interview with the author of The Twilight Herald was conducted back when his first novel, The Stormcaller, was just coming out, so we are very glad to see it finally posted. Here's a taste: "The idea evolved over several years. I'd had the first scene stuck in my head for a while, a dream originally, so it was the natural start for the book, but I didn't actually have a plot to begin with. When I started writing I just started sketching out ideas for the world and how I'd like it to be populated. 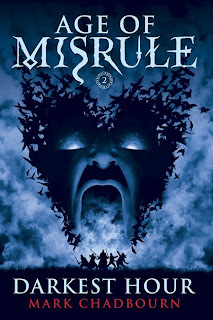 I've always loved the quarrelsome gods of Norse mythology and decided that I wanted more involvement from gods than most books I'd read." 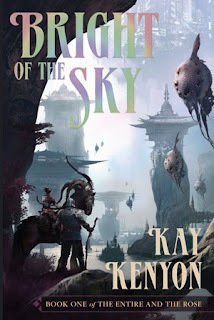 From Pat's Fantasy Hotlist: "With Bright of the Sky and A World Too Near, Kay Kenyon established herself as one of the most underrated science fiction authors out there. In my opinion, The Entire and the Rose is without a doubt one of the most fascinating scifi series on the market today. In City Without End, Kenyon elevates this series to new heights.... Kay Kenyon's latest is full of surprising twists and turns, and the plot moves forward at a crisp pace. No offense to Peter F. Hamilton and other scifi authors in the middle of ongoing series, but The Entire and the Rose could well be the best game in town right now. I commend this series to your attention. Can't wait to see how the author will close the show!" David Low, I mean. 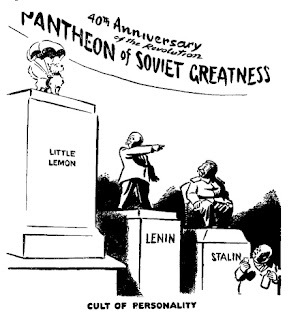 And the only purpose of this post is to direct you to another post saying how much I enjoyed reading a collection of the great man's political cartoons (the volume in question is styled as an illustrated recapitulation of the 1950s). Lots of SF there, because of course the 1950s was the decade in which SF began properly to interpenetrate the general cultural discourse ... Sputnik, Laika et al. Incidentally, did you know that the first dog in space actually had four, count-em, four names? Why so many? I don't know; but I concur with Low that, though 'Laika' was perfectly descriptive of the little creature (Лайка, "Barker"), a cartoonist had better make use of one of the others (Лимончик, "Little Lemon"). Because it is funnier. 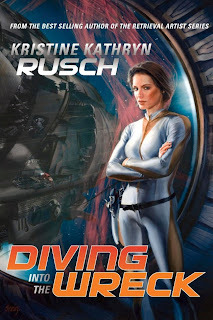 In a few short days, if not sooner, I'll be able to show you the truly amazing cover - with artwork by Dave Seeley - for Kristine Kathryn Rusch's forthcoming novel, Diving into the Wreck (based on her Asimov's Readers Choice Award-winning novella of the same name.) In the meantime, those who want a sample of her "Diving" universe are directed to the 400th issue of Asimov's Science Fiction magazine. "The Spires of Denon" (partial excerpt here) is the cover story! ...the future is closer than you think?